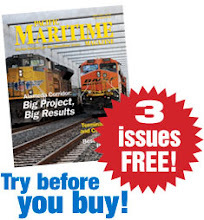 Outreach and engagement are the themes of the 2013 eNavigation conference, which is sponsored by Pacific Maritime Magazine and set for November in Seattle. The two day event is expected to focus on the real world experience of e-navigation from industry sectors in the US and abroad. Through interactive discussions, presentation of case studies and examination of real world application of navigational technology, eNavigation 2013 will feature as part of its agenda a presentation by the Committee on the Marine Transportation System (CMTS) e-Nav Integrated Action Team regarding progress on the interagency work group’s work plan and recommendation. Other sessions will examine how other maritime nations are implementing their own e-navigation plans. Also to be discussed is regulatory and legislative change as they relate to e-navigation. The event, which takes place Nov. 19-20 at the Red Lion Hotel on Fifth Avenue in Seattle, is now open for registration and sponsorships. Early bird registration ends Oct. 28. For registration information, contact Denise Philips at 206-284-8285 or denise@philipspublishing.com. To reserve a sponsorship, contact Bill Forslund at bill@philipspublishing.com.